Spend the day at one of the oldest and largest botanical gardens in the world, the New York Botanical Gardens. 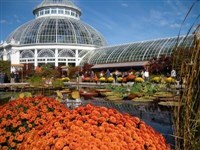 Spend the day at one of the oldest and largest botanical gardens in the world. The New York Botanical Gardens in the Bronx is a museum of plants and a National Historic Landmark, with 250 acres of gorgeous grounds, 48 gardens and plant collections, as well as thousands of shrubs and trees plus 40 acres of the forest that once covered all of New York, and the spectacular Enid A. Haupt Conservatory. Your admission includes: Garden grounds, Enid A. Haupt Conservatory, Everett Children’s Adventure Garden, Rock Garden and Native Plant Garden Tram Tour, other daily venues and events of the day. A lite food stop enroute home not included in the cost of the tour.